The decision to send two infantry battalions, the Royal Rifles of Canada from eastern Quebec and the Winnipeg Grenadiers, to aid in the defence of Hong Kong was made in September 1941. The British and American governments were seeking ways of deterring Japan from continuing its aggressive expansion in Asia by reinforcing garrisons in Singapore, Malaysia and the Philippines. Canada was asked to do its part by strengthening the defences of Hong Kong. Neither battalion was fully trained or equipped for modern war but both officers and men proved to be courageous in battle. They arrived in Hong Kong on the 16 November 1941, three weeks before the Japanese attack on Pearl Harbour and the outposts of British and American power in the Pacific. 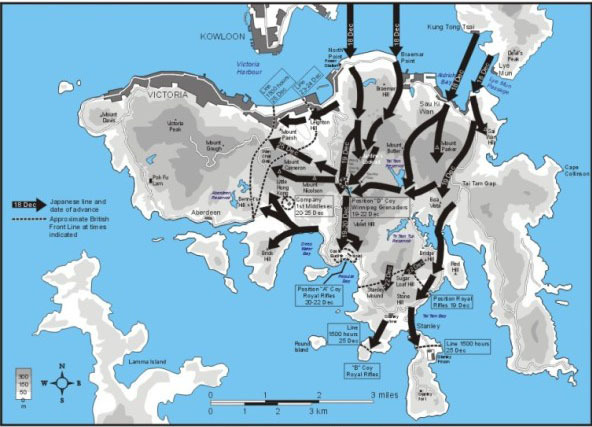 The Japanese used a reinforced division to attack Hong Kong and quickly overwhelmed the British and Indian troops on the mainland. On 18 December the assault on the island began and both Canadian battalions were involved in difficult and costly battles. During one action Sergeant-Major J. R. Osborn led a bayonet charge to secure a hill top. When the enemy counterattacked with hand grenades Osborn caught several and threw them back until one grenade fell where he could not reach it. Shouting a warning he threw himself upon it as it exploded, giving his life for his comrades. Osborn was subsequently awarded the Victoria Cross. The fighting cost the Canadians 290 killed with almost 500 wounded. During the long years of deprivation and slave labour in prisoner of war camps another 264 died including four men executed for trying to escape. After the war the 1,148 who returned to Canada waged a second struggle to overcome disabilities and obtain compensation for their sacrifice.